In a pot, add the milk and sugar and bring to boil. Add the water to the custard powder and once the milk comes to a boil, pour in the custard powder a little at a time, stirring constantly to avoid any lumps. After adding the custard, continue cooking for a few minutes, stirring constantly and then remove from stove. Let the cooked custard cool for a few minutes. Or any fruit you want just chop them or dice them. You can even use canned fruits, mix with fresh fruit. Peel and dice all the fruits and mix the together. Add a little bit of sugar to the fruits (optional). 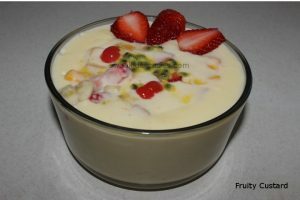 Now pour almost all of the custard to the fruits and mix well. Leave some custard for serving. 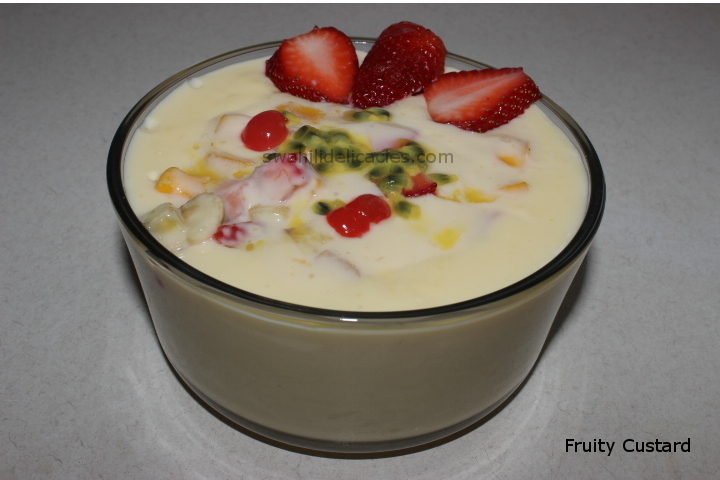 In a serving bowl pour the left over custard and then pour the custard mixed with fruits. Garnish anyway you like and serve cold.